The history behind them is not as romantic as you would think. For newlyweds, the honeymoon is often the best part of tying the knot. The thought of going on a romantic getaway with your new spouse, while tuning out the rest of the world, is pure bliss. But have you ever wondered how the tradition came about? The custom actually originated in 19th century Britain, but it wasn't the blissful escape it is now. While it did consist of newlyweds traveling together, they basically went on a trip to visit family members and friends who couldn't make it to the ceremony (so, forget about alone time). 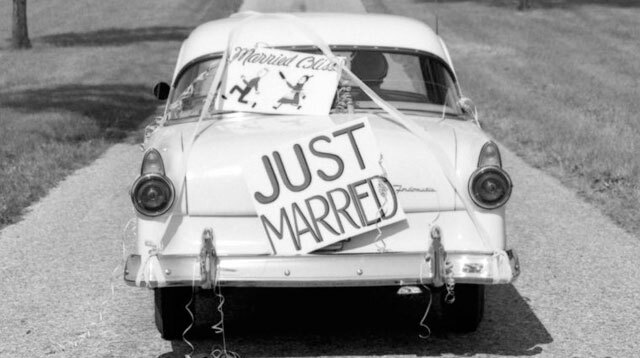 It wasn't until the late 1800s that honeymoons started to look like they do today, according to Sara Margulis, CEO of Honeyfund, an online wedding registry. As far as where the term "honeymoon" comes from, a few theories present a very different picture of the beloved vacation. The first, as Sara explains, stems from a tradition dating back to the 5th century. Back then, newlywed couples would drink mead, a honey-based alcohol, after their first "moon" together as a married couple. The mead was a gift from guests, and it was believed to have aphrodisiac properties to help with conception. The term's origin can also be traced back to 16th century authors Richard Huloet and Samuel Johnson, who both expressed rather skeptical views of the tradition. Richard, in particular, referred to the honeymoon as a "hony mone," says Kim Forrest, a wedding trends expert at WeddingWire. Hony mone, a term proverbially applied to such as be newly married, which will not fall out at the first, but th'one loveth the other at the beginning exceedingly, the likelihood of their exceeding love appearing to aswage, ye which time the vulgar people call the hony mone. Translation: The couple may be perfectly happy now, but it won't last that long. (Ouch.) Kim also points out another shocking theory on the tradition: "The word may come from the Nordic word "hjunottsmanathr." This refers to when the groom would actually kidnap his bride and hide her until her family stopped looking for her," she says. Thankfully, times have changed since then. Recently, the modern honeymoon has seen another important change, brought on by busy schedules and budget constraints. Couples are now either waiting for some time after their wedding to save up for the best trip possible, or, as Kim explains, taking a "mini moon." "This is a short trip taken immediately after the wedding to a destination relatively nearby to experience a getaway without breaking the bank," she says. "Couples often do this if they're planning a big trip for later on, or if they are unable to take a long time off work shortly after their wedding." Two honeymoons? That's an idea we can get behind.